As a special collections library, books must stay inside the library. Prior to leaving the Library, books should be placed on the marked windowsill in the main reading room or the counter in the round-table study corner for the Library staff to re-shelve. Please do not reshelve the books yourself. Food is not allowed past the Hong Kierkegaard Library entrance but beverages in a covered container are acceptable. No drinks of any kind are allowed when using the rare book room materials. Due to a large number of visiting scholars during the summer, offices within the Library cannot be reserved for individual use. Any open seats or unused offices are available on a first come, first serve basis. Offices left unattended will be considered available for the next scholar. During the academic year, scholars typically have their own office. Kierkegaard House Foundation Fellows keep their office for the entire time of their position. The Library prohibits marks or notations written on any book in our collection (post-it notes included). Return the “flag” card with the call number of each book before returning it for re-shelving. Please inform Library staff members if materials you are using seem in need of repair or, if they do not have a call number taped to the spine, are missing their respective “flag” card. As always, drinks with lids are the only sort of consumable food product allowed inside the Library. If you wish to have a snack/meal, you are welcome to use the lounge located outside of the library. At the Hong Kierkegaard Library, the majority of the 20,000 volume collection is cataloged via the Library of Congress classification system while part of the collection uses a system created specifically for the Hong Kierkegaard Library. The St. Olaf/Carleton consortium electronic catalog (Catalyst) includes an updated list of the current materials available for use in the Carleton, St. Olaf, and Kierkegaard Libraries. A guide describing how to use Catalyst can be found here. A search by “subject” in the Catalyst search engine will include our specialized subject headings. A “keyword” search will provide a broader bibliography for any subject search. Please note all call numbers carefully in order to avoid confusion. See our collection page for further information on the Library’s arrangement or ask one of the student workers for a Library tour. Scholars wishing to use materials from the Rare Book Room, home to the Library’s materials published before 1856 and other rare or fragile materials, should contact Curator Gordon Marino or Eileen Shimota. These titles must be signed both in and out and MUST NOT leave the confines of the Library for any reason. Materials taken from the Rare Book Room must be used on the table in the Reference Room or on the circular table in the circular-table study room of the library. There are special requirements when using the materials that will be communicated when the request is made. Flash photography and any sort of scanning of the Rare Book Room materials will only be permitted upon request. Scholars may not take the Rare Book Room materials into an office unattended by a Library staff member. Our collection of periodical articles, lectures, and other sensitive documents are located in the file cabinets inside the reference room. Please sign up on the sheet before taking articles out and remain inside the Library when you use them. These materials can be returned to the marked windowsill in the main reading room or the counter in the circular-table room for our staff to re-shelve. Please see the Library staff for more details. The Kierkegaard Library is developing an Archive that includes materials related to the biographies and work of Howard and Edna Hong and other Kierkegaard scholars, the history of the Kierkegaard Library at St. Olaf College, and the history of Kierkegaard studies worldwide. Scholars are responsible for observing copyright laws with regard to making photocopies for personal use. If a scholar plans to photocopy/scan one of the Library’s materials, the scholar must notify one of the staff before they take the materials to the photocopier machine. The photocopy machine is the 2nd door down the hallway to the right. Taking materials to photocopy with permission from Eileen Shimota, Gordon Marino, or one of the student workers is the ONLY circumstance in which materials can leave the Kierkegaard Library. This machine also has the capacity to scan and send the file to your email or a USB drive, which is free of charge. Printed copies can be made using your St. Olaf ID card if you deposit funds on your card. This deposit can be made in the Cage, a small café on the second floor of Buntrock, or in the St. Olaf Bookstore. Copying of materials from the Rare Book Room is done by staff only and depends upon the materials’ condition, etc. No photos may be taken in the Rare Book Room without the approval of Eileen Shimota or Gordon Marino. Scholars using scanning “pens” to copy materials directly into their computers need to notify us beforehand. We will ask for recognition in any document related to your use of our materials. Again, each scholar is personally responsible for observing copyright law. Access to indexes are available through the St. Olaf libraries or through interlibrary loan. Electronic journal databases (such as JSTOR) are available to patrons of the Kierkegaard Library with some materials available in full-text. A helpful reference is the Websites for Philosophy that is maintained by the St. Olaf Libraries. The Kierkegaard Library also maintains a master list of online Danish resources and related sites. Scholars are also welcome to use the Rolvaag Memorial Library, the main library of St. Olaf College, as well as the Halvorson Music Library. Your St. Olaf ID card will allow you to borrow materials from all of the on-campus libraries. Rolvaag’s holdings include some Kierkegaard studies materials and other significant theological and philosophical works. 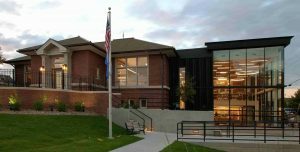 In addition, the St. Olaf ID card gives scholars access to the Gould Library, the main library of the Carleton College, located a short 30-minute walk into downtown Northfield.